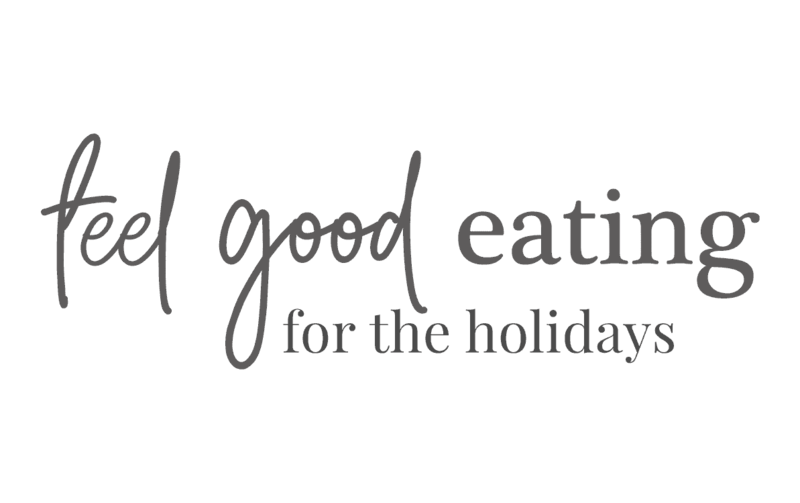 Feel Good Eating for the Holidays is closed for another year. You might like to check out one of my other online programs. Have you noticed that rather than feeling festive, the holidays often cause people to stress out about all the extra food and alcohol that is available and what it will do to their body? Maybe this is your experience too? Don’t think you will have time for this in the lead up to Christmas? Don’t worry, each day has quick, easily digestible content that only requires about 10-15 minutes of your time – easy! A done for you workbook that contains space to work through each of the daily topic’s activities. Print it off to handwrite in, or fill in electronically – the choice is yours. 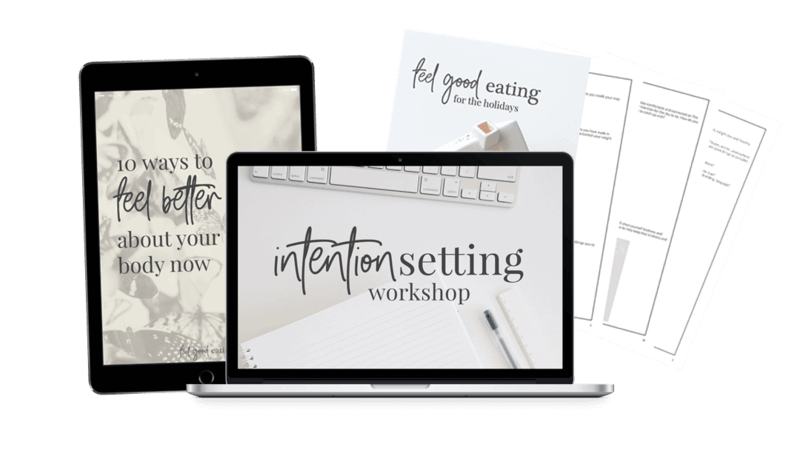 Receive access to my brand new intention setting workshop. Rather than set another dodgy New Years Resolution, use this on-demand workshop to work out what is really important to you and how you can live in alignment with your values and intentions. This workshop will be available to purchase separately, however, it is yours free when you join Feel Good Eating For The Holidays. 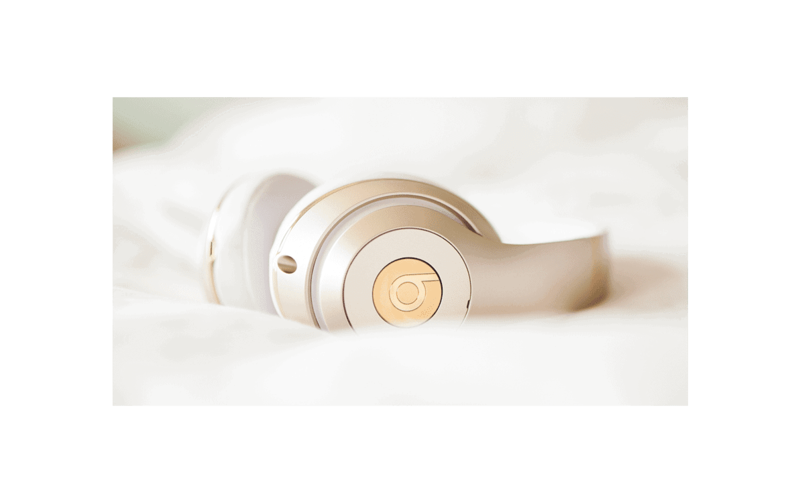 Use this downloadable body scan guided meditation to deepen your connection with the physical sensations in your body. Developing a mindful awareness of your bodily sensations is one of the first foundational steps of mindful eating. One of the things you asked me for in your feedback last year was some content around body acceptance. So here it is! 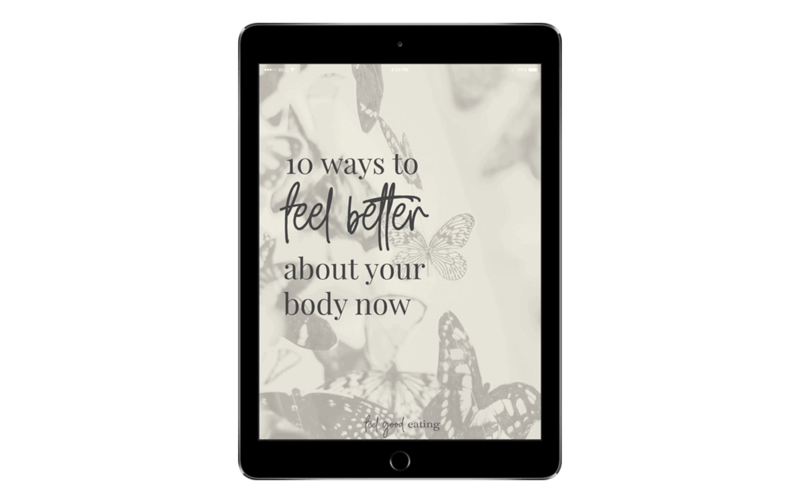 My guide on 10 ways to feel better about your body now. 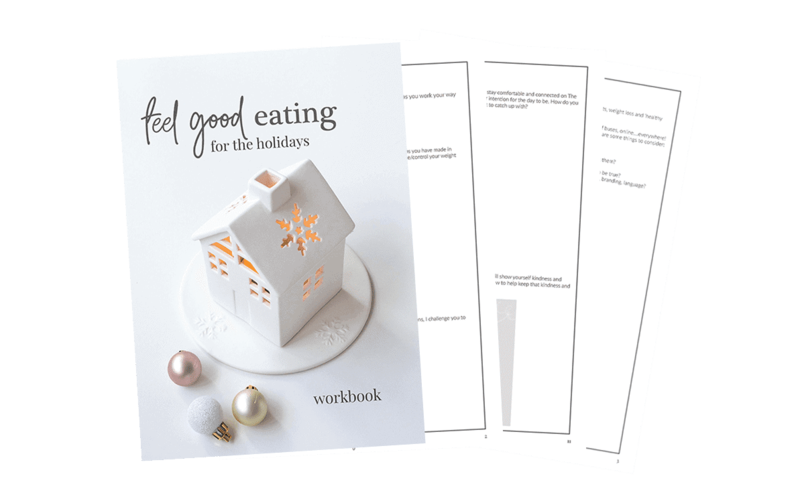 The content for Feel Good Eating For The Holidays will be delivered to your email inbox Monday-Friday as soon as you sign up for 16 days. There will be no content on weekends because we all need to recharge our batteries! Plus the weekend will offer the opportunity to catch up on anything you didn’t get to during the week. Each day you will be invited to take action on the daily topic which you can choose to complete if it feels comfortable for you. There will also be some extra materials that you might like to explore to deepen your understanding of the topic. The program workbook, body scan guided meditation and 10 ways to feel better about your body bonuses will be available when you join. 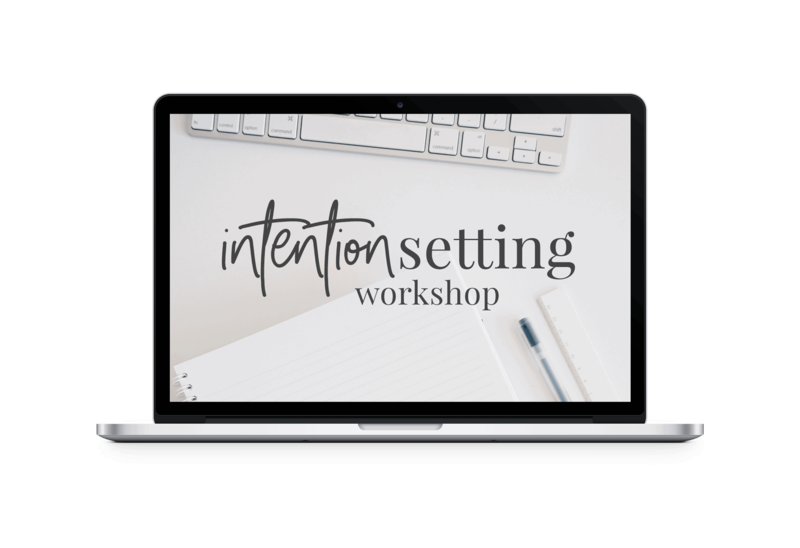 Access to the intention setting workshop will be provided separately after the conclusion of the program. As an evidence-based practitioner, it is my role to support you to understand the evidence for and against different approaches and empower you to find ways to stop dieting and take care of yourself without focussing on weight loss. That is not to say if you are looking to lose weight, you can’t join this program. Most of my clients want to quit dieting, enjoy eating and look after their body AND want to change their body at the same time. Just know that Feel Good Eating For The Holidays is not a weight loss program. I did Feel Good Eating For The Holidays last year. How is this different? The content will be delivered via email, so as long as you keep your emails, you will have access forever!